The recipe swap for this month is holiday treats! While you can obviously make cookies or other desserts throughout the year, its just different to me to make them around the holidays. Maybe its being able to look a the pretty decorations or the tree while the cookies are baking in the oven. Or maybe its just that its cold outside and the cookies in the oven heat up the house. Anyway, for this swap, I was given Peanut Butter Cups from Ashley at Cheese Curd in Paradise. Ashley has a lot of tasty looking meals on her blog which all make me think of comfort food and sitting down to a nice hot dinner in a warm house while its freezing outside. Which probably is pretty realistic, considering she lives in Wisconsin. My first thought when I saw this recipe was “Damn!” Not because I have anything against chocolate or peanut butter (I’m actually a big fan) but because the recipe says to use a mini muffin pan. Guess who currently does not have a mini muffin pan and is getting one for Christmas? Yep, this girl. I thought for a few minutes about just going out and buying a mini muffin pan since having two of them definitely wouldn’t be the worst thing in the world. But then I realized that if I did that, it would be an open invitation to my brain to eat more peanut butter cups because the chocoholic part of my brain would rationalize smaller candy = eat more candy. Since I decide to start think strongly about consider exercising and watching what I eat, I figured that probably wasn’t in the best interest for my inner chocoholic. 1. Line a cupcake or muffin pan with paper liners and spray with non-stick cooking spray. 2. Fill the bottom pot of a double boiler with about one inch of water. Bring to a simmer over medium-high heat. Place the second pot of the double boiler on top. Add half of the chocolate. Stir with a wooden spoon until the chocolate has melted and is glossy. 3. Spoon the melted chocolate into each of the paper liners, making sure to get some up the sides of the liner. Transfer the pan to the refrigerator to let the chocolate set, about 10 minutes. 4. Meanwhile, in a small bowl, combine the peanut butter, butter and honey. Stir until everything is incorporated. Bring the water in the double boiler back to a simmer. Add the remaining chocolate to the top pan and stir until smooth and glossy. 5. Remove the pan from the refrigerator. Scoop the peanut butter mixture on top of the chocolate. Spread the melted chocolate over the peanut butter and return to the refrigerator for at least 30 minutes. To store, leave the peanut butter cups in their paper liners. Peanut butter cups can be stacked in a plastic container with pieces of wax paper between each level. Keep refrigerated. These were really good and much better than the kind you can buy at the store! Since I used a regular sized pan, I needed to increase the amount of chocolate. I did use the original amount of the remaining ingredients but since I had more than half left over, I halved the recipe. 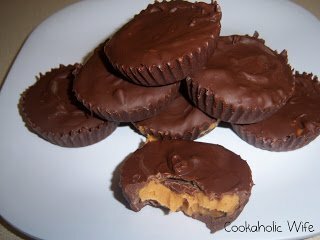 The peanut butter cups are definitely a quick dessert you can whip up if company unexpectedly stops by or a just a great dessert you can easily make ahead of time! If you’re curious to see what other holiday treats were part of this recipe swap, Sarah of Taste of Home Cooking does a recap of all the recipes each swap!